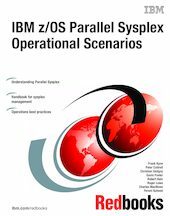 This IBM® Redbooks® publication is a major update to the Parallel Sysplex® Operational Scenarios book, originally published in 1997. The book is intended for operators and system programmers, and is intended to provide an understanding of Parallel Sysplex operations. This understanding, together with the examples provided in this book, will help you effectively manage a Parallel Sysplex and maximize its availability and effectiveness. The book has been updated to reflect the latest sysplex technologies and current recommendations, based on the experiences of many sysplex customers over the last 10 years. It is our hope that readers will find this to be a useful handbook for day-to-day sysplex operation, providing you with the understanding and confidence to expand your exploitation of the many capabilities of a Parallel Sysplex. Knowledge of single-system z/OS® operations is assumed. This book does not go into detailed recovery scenarios for IBM subsystem components, such as CICS® Transaction Server, DB2® or IMS. These are covered in great depth in other Redbooks publications.